I hope Bag O’Turnips can identify the horsepower of this letterbox. Embleton. This entry was posted in worst letterbox and tagged embleton, V8, worst letterbox. Bookmark the permalink. The long lost bogan cousin of Johnny Number 5. Keithy Number 37 ? Embleton is the purgatory of Bayswater, if such a place exists. The name Embleton honours an early settler, George Embleton, who arrived in 1829 as a servant of Dr John Watley, who had settled in the Bayswater district. 2006 Census data supports a hypothesis that George embodies the suburb inhabitants. Beetlejuice 3 times or something will summon a union official or Labor party volunteer. The ground is sour. Different world north and south of Collier. 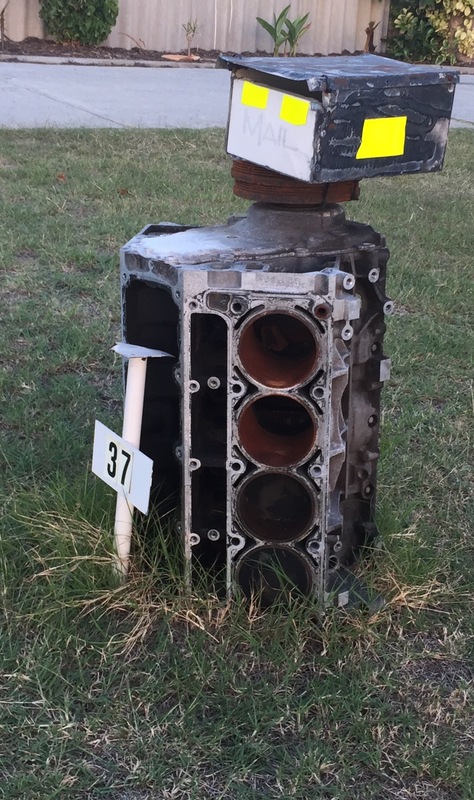 Sure, it’s a V8 engine block, but it ain’t gonna make Straya Post go any faster, I’m afraid. That’s a venerable General Motors LS1 small block V8 if I’m not mistaken. Standard fitment to the Holden HSV. You’ll likely find the remainder of the vehicle protruding through the master bedroom at eave height. renewed hostilities in the Holden vs Ford wars? I bet that reeks of dog piss.